Lightning in a Bot’s first product, Shoppy Bot, is a natural language chatbot that Shopify store owners can use to query their business data. The natural language interface is a novel approach to reporting and analytics in a backend retail setting, and one we hypothesis can provide faster and more efficient access to important data. The first version of Shoppy Bot used Wit.ai’s natural language API to convert user requests such as “how many customers have we had this week?” into structured data that we could convert into SQL queries and other various functions. Problems with these cloud services became apparent early on, therefore we began to explore what it would take to build our own Natural Language Understanding (NLU) service, one designed specifically for the task at hand. This post serves as an overview of the theory behind our approach and outlines specific implementation details in developing our own NLU system, now known internally as “Bolt”. Semantics is a field of linguistics which concerns itself with the meaning of language, both written and spoken. Natural Language Understanding is a broad field that attempts to assign semantics to spoken or written language in order to derive understanding. Computer scientists, linguists, and machine learning engineers attempt to use this understanding as actionable information when developing applications. NLU presents unique challenges to engineers due to ambiguousness, variability in style and formation, context, prior knowledge dependency and the disparity between different languages themselves. One successful method that provides a good framework for generating actionable information from natural language is the intent-slot paradigm. The intent-slot paradigm is a method of Natural Language Understanding that combines a number of core Natural Language Processing and Information Extraction techniques in order to derive a semantic understanding of written language. In Shoppy Bot’s case, the derivation is a semantic understanding of the user’s question about their business data. There are three major types of information extracted under this NLU model: Intents, Slots, and Entities. Query: What is the shipping information for order #2314? Query: How many returning customers did I have in [the first quarter of 2015]? Query: Get me [Winona Snyder’s] most recent order. Often a goal of the design of an NLU system, especially one designed for a targeted domain, is to provide as much generality as possible. This often means that the system’s goal centers around supporting as many users and/or as many use cases as possible with a minimal amount of model generation and methods. The reason being is that the implementation of certain NLP features can be reused and shared. Share models are easier to maintain (no management of devoted models). Additionally, new training data generated by user behavior effectively crowd sourced. For example, in Bolt, the mechanism that determines a user’s intent is shared amongst all users. This way, new data (such as new variations of a similar query) can be incorporated into a newly trained model for which all users share the benefit. However, there are certain times when specificity takes precedence over generality. In our case, each one of our Shoppy Bot users has a store with a wide range of products, each with unique names. When parsing a query for slots and entities, an NLU system has to return information that is specific to that user. Avoiding returning information from one user to another is also a requirement as our customers expect their data and analytics to be protected. Bolt employs a fast dictionary/gazetteer algorithm that utilizes distinct data structures specific to each of our users. The following outlines three specific implementation details of the Bolt NLU system developed for Shoppy Bot in terms of the intent-slot NLU paradigm. Intent categorization is achieved most commonly through state-of-the-art text classifiers. Bolt uses a discriminative classifier known as a support vector machine. Briefly, support vector machines (SVMs) are classifiers that construct non-probabilistic models represented in a geometric manner. Data is mapped into a geometric space. The different categories or classes of data are separated by a hyperplane optimized for achieving the largest distance between the closest data points of two different categories. 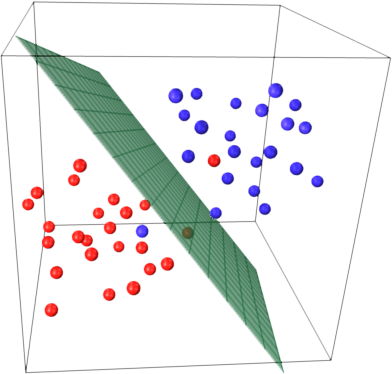 The technical details of support vector machines are beyond the scope of this post, but they are the soup du jour for text classifiers (especially for smaller datasets) and are fairly robust against outlier data. Bolt uses the fantastic library Scikit-learn and its implementation of an SVM. Specifically we use the class LinearSVC. It supports multi-class classification and scales to larger datasets decently by employing liblinear instead of libsvm. One challenge is that many SVM’s underlying implementations, such as libsvm, are quadratic in their algorithmic complexity which can make datasets >10000 samples highly inefficient. LinearSVC performs well as it does not use any kernel function to turn a dataset that is non-linear into a linearly interpretable dataset, thus dramatically enhancing the algorithmic efficiency. Any machine learning technique is powerless without data. Data must be curated in a way that best represents pertinent information about your problem. Bolt’s intent classification challenge is first and foremost a text classification problem. We take a user’s text query and classify that text into an intent category. Determining what type of data you give your machine learning algorithm is a process called feature generation. One of the most common ways to generate features (data tailored for use in a machine learning algorithm) from text is to employ a simple technique known as the ‘bag-of-words’ technique. The frequency (number of occurrences) of all the words for each text category are used as specific values for data points in the geometric space we generate. Similar words are used repeatedly for similar user intents. It plays to Bolt’s advantage that queries are often specific to the task at hand, which limits the amount of noise (overlap of categories) and number of outliers (single data points invading deep into the region of a different category). This means that the distinction between one category and another in our geometric space is sharp. I won’t go too deep into how SVM’s work, but I suggest Wikipedia as a good starting point. Slot detection sometimes blurs the line between entity parsing and recognition. It can help to think of named entity recognition (NER), where one parses a product name, city and state etc., as a subset of slot detection. Slots can be a feature of the entire piece of text being analyzed or a localized span of text. One example of a slot that spans the entirety of a user query would be plurality. For example, if the user asks, “Who is my top customer?”, Bolt is able to recognize that the person is asking for only one customer, without needing any explicit number to exist in the query. These results are passed back to Shoppy Bot where a response is sent to the user with the results for one customer. Bolt actually uses a binary classifier to determine the query’s plurality. We use a similar ‘bag of words’ technique as the intent classifier but also employ a technique that emphasizes particular features. The emphasized features are words associated with plurality. For example, verb conjugation plays an obvious role in identifying whether or not the query is asking for plural results. The verbs ‘is/are’, ‘was/were’ greatly increase the accuracy of the classification model without the need for large amounts of data. It is a case where smart feature engineering helped defeat a lack of data on our end. As the slot detection of plurality is independent of any specific user, it is a generalizable model. Named entity recognition is the probably the most well-known aspect of information retrieval and slot detection in terms of NLP. Shoppy Bot users each have a large set of product names associated with their Shopify store. These “named entities” must be identified and parsed specific to the user. Bolt employs a set of data structures and a specialized string comparison algorithm to successfully parse product names from a user’s query. The data structure that Bolt’s gazetteer uses is called a trie. 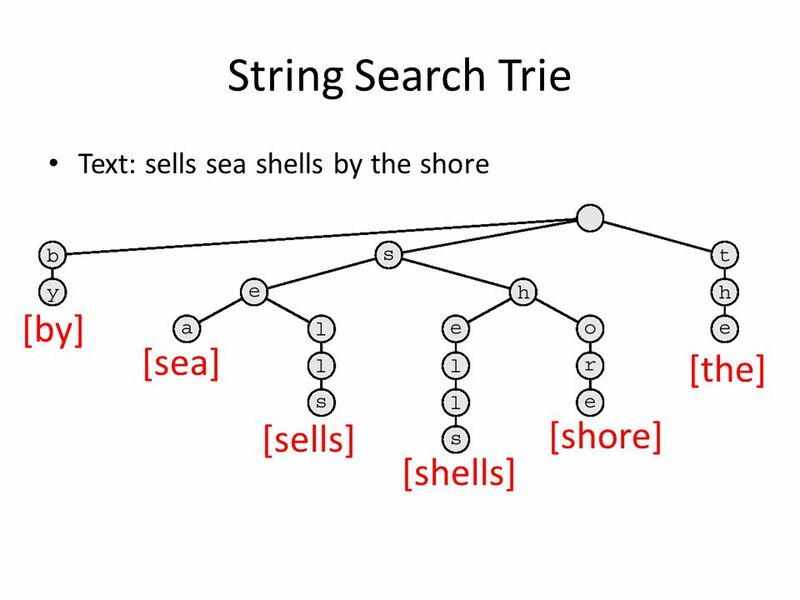 In this scenario, a trie is an ordered tree structure that stores strings compactly, where each node of the tree is an object or structure that stores the current letter, potentially a word, and references or pointers to the next node. The idea is that in traversing a branch of the trie, you slowly build up a word letter by letter. Words that share the same prefix will start along the same branch. This data structure allows one to check if a word is in a dictionary extremely quickly but also allows for additional algorithms to function during the search process. Hash lookups for words are generally the fastest mechanism for dictionary lookups. However, if you want to perform string similarity comparisons while searching for a word in a dictionary at the same time, the search trie is your best bet. This allows for robust dictionary lookup of words pulled from the query to see if they match (or are close to matching) the words stored in the trie. Ultimately this is a very robust way to perform fuzzy dictionary lookups. The string similarity mechanism Bolt’s gazetteer uses is the Levenshtein string similarity algorithm. Briefly, it is an algorithm that outputs an integer value called the string distance representing the number of insertions, switches, and deletions it takes to convert one word into another. After removing common words and certain specialty words from the query, the remaining words are grouped in a number of combinations. These combinations of words are each run through the gazetteer’s search algorithm to find matches within a certain Levenshtein string distance. The algorithm traverses down the trie building test words from the letters along the nodes in the path. The algorithm can dynamically append or remove new letters from the current current trie word so that the Levenshtein algorithm only has to readjust for the new letter in its comparison with the test word from the query. Thus we are not constantly performing and reperforming the entire Levenshtein algorithm for every word in the trie. One additional step Bolt takes to ensure robustness is to add n-grams and skip-grams of the product names into the trie. For example, ‘sally sells sea shells’ as n-grams of length 3 (tri-grams) would be split into ‘sally sells sea’ and ‘sells sea shells’. Skip-grams of length skip distance 1 would result in ‘sally sea shells’ and ‘sally sells shells’. The purpose of these n-grams and skip grams is to account for the different ways a user might express a product name. Perhaps they don’t type every single word if it is a long product name. This post provided a fairly indepth overview of some of the theory and implementation details that go into making the Bolt NLU system function. Natural language understanding is exploding and becoming more advanced day by day. The intent-slot paradigm for NLU is a robust and relatively simplistic approach to NLU that can be achieved fairly easily with some simple and clever algorithms and engineering. With this approach, we’re able to provide an NLU system that outperforms other cloud-based solutions on the market, and offer a more sophisticated chatbot experience. The cover started as a photo of lichen on rock to which we applied canny edge detection to outline the texture of the rock and plant. © Lightning in a Bot Inc.